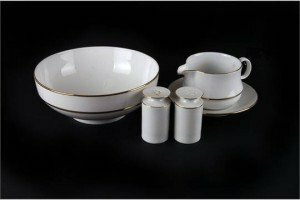 A German porcelain service, comprising a milk jug and matching saucer, salt and pepper shakers and a large salad bowl. 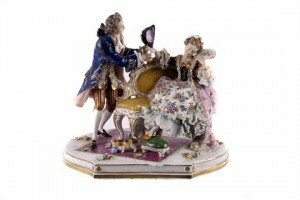 A 19th century German porcelain figure group, of a courting couple, stamped to the base with ‘Frankenthal’ factory mark, 23cm high. 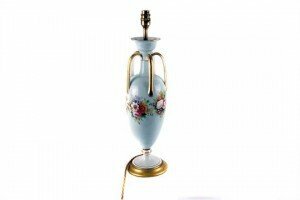 A French porcelain lamp base, with the ovoid body with duck egg ground, and painted with sprays of flowers, 44cm high. 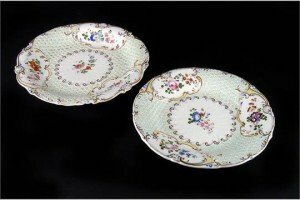 A pair of Ridgway porcelain ‘Daniel’ pattern plates, the central open floral spray against a floral ground, heightened in gilt, number to underside 4631. 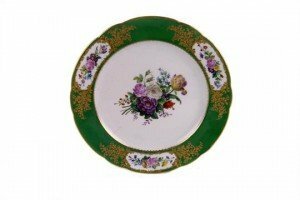 A 19th century French porcelain apple-green ground cabinet plate, by Jean Pierre Feuillet, decorated to the centre and border cartouches with a spray of flowers. 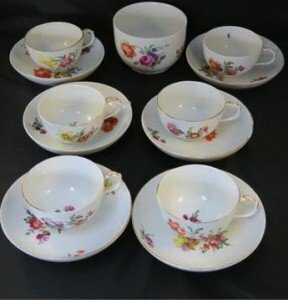 A set of Berlin porcelain late 18th or early 19th century, comprising six cups, six tea bowls and a basin. Gilding rubbed, floral sprigs in good order, marked in blue beneath with sceptre of Elector of Brandenburg. 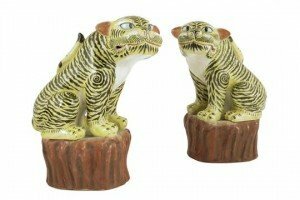 A pair of Chinese porcelain models of tigers, in Kangxi style, each seated on a rocky outcrop. 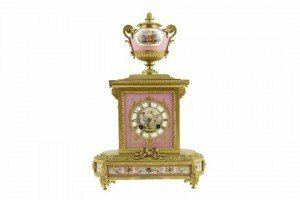 A 19th century French ormolu and porcelain mantel clock, the eight day movement striking on a bell, the porcelain dial with Roman numerals, within a Louis XVI style case with an urn surmount, the porcelain painted with basket of fruit, classical figures and panels of urns and flowers. 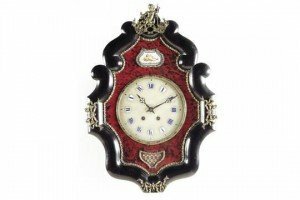 A French vineyard clock, the porcelain dial applied with enamel numeral reserves, the striking movement in a tortoiseshell veneered case set with a porcelain plaque of a putto, in a shaped ebonized frame, the whole with gilt brass mounts. 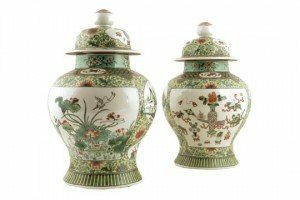 A pair of Chinese porcelain famille verte baluster vases and covers, decorated with panels of landscapes, flowers, birds and fish with also a large panel depicting scholar’s objects, late 19th. 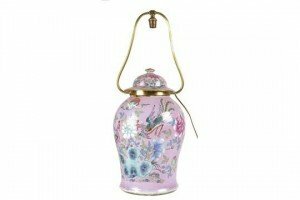 A Chinese porcelain baluster vase and cover table lamp, painted in the famille rose palate with exotic birds, flowers and bats, with a gilt brass fitting. 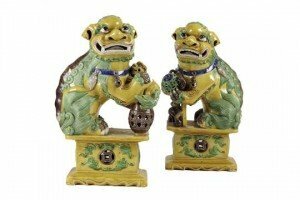 A pair of Chinese biscuit porcelain Buddhist lion dogs, in Kangxi style, the female with her puppy, the male with a pierced ball, late 19th century. A 9ct gold signet ring, two further signet rings, one set with bloodstone, a further yellow metal decorative ring, and a white metal ring. 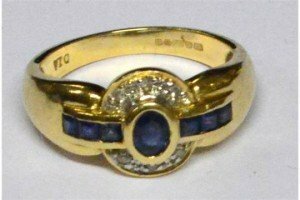 A 14ct yellow gold Art Deco style sapphire and diamond ring with central collet set oval sapphire flanked by three small sapphires on either side and a circle of six diamond chips. 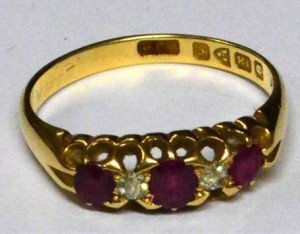 An 18ct yellow gold ruby and diamond ring, with three oval rubies alternating with two small diamonds, all set in a pierced gallery. An Edwardian 15ct gold bar brooch with filigree frame and centred with seven diamonds in a floral spray. 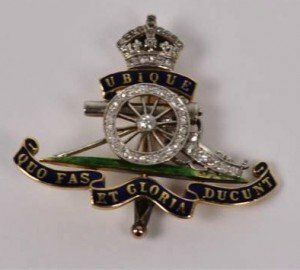 A yellow metal and diamond Royal Artillery brooch with enamel decoration and with spinning cannon wheel. 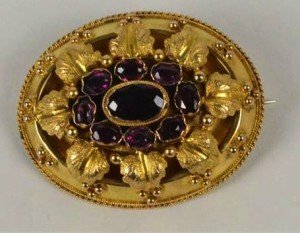 A Victorian yellow metal oval mourning brooch, the leaf border surrounding a cluster of garnets with picture/hair aperture to reverse. 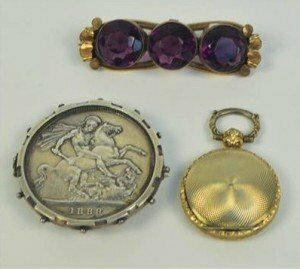 A Victoria crown, 1889, mounted in white metal as a brooch with a safety chain, a three stone brooch set in yellow metal, and a circular yellow metal mourning pendant with inscription to hinged side. 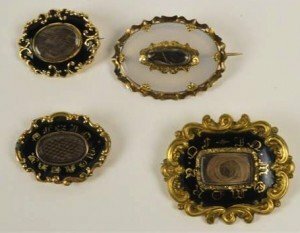 Four Victorian mourning brooches including three in scrolling frames with central panel of plaited hair within a black enamelled border, and a similar example with hardstone central oval plaque.